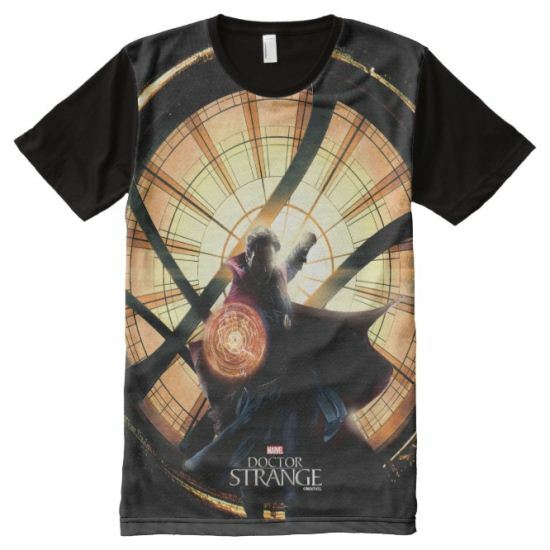 Check out our discoveries of the most awesome Doctor Strange T-Shirts below. 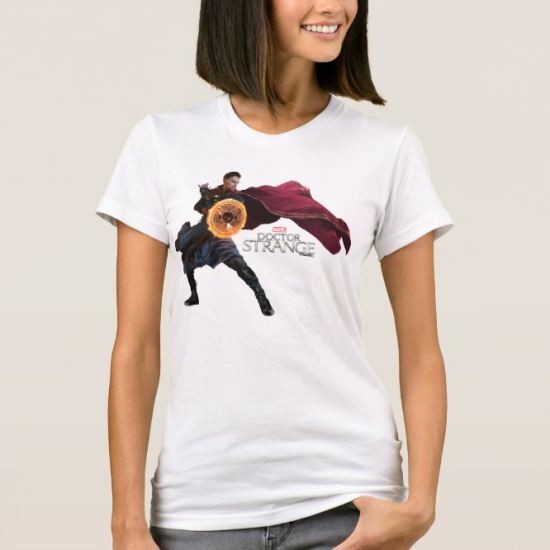 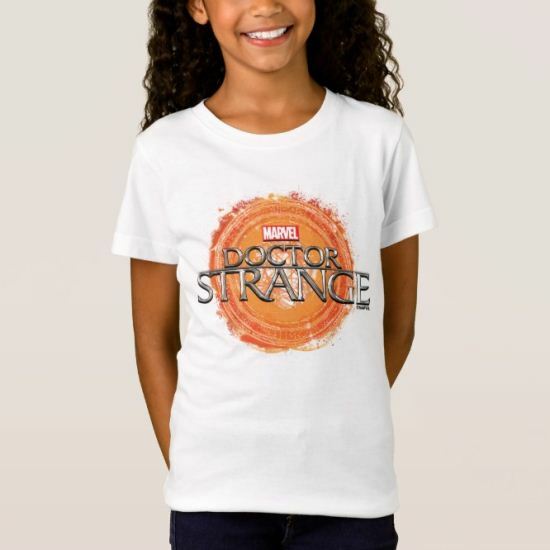 We simply find and round up all Doctor Strange T-Shirts scattered around the Internet that we think are cool so that you don't have to. 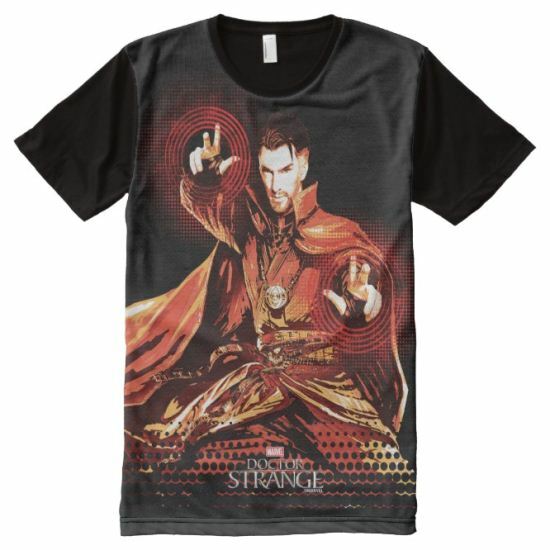 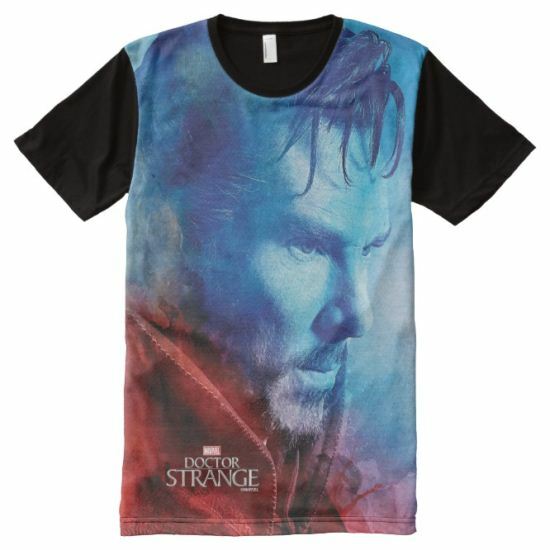 If you find these Doctor Strange T-Shirts really cool, do not hesitate to share with your friends. 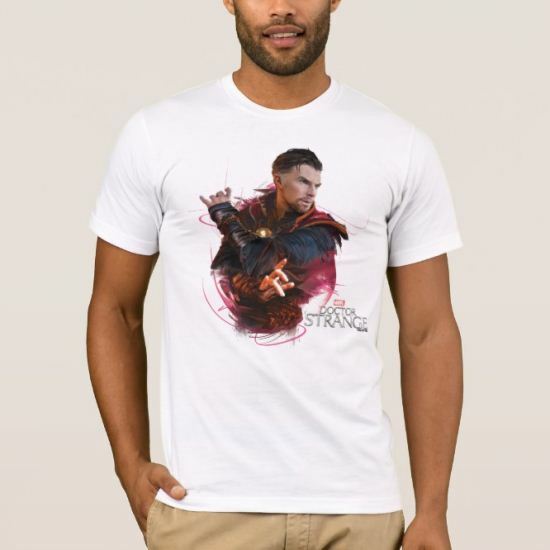 Doctor Strange Mystic Hand Movie Poster All-Over Print T-Shirt ~ Check out Doctor Strange as he holds up a mystic hand gesture that reveals his face. 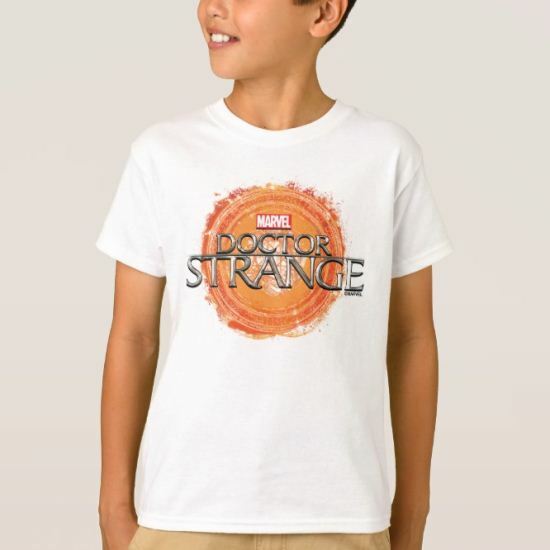 Doctor Strange In Front of Window of Worlds T-Shirt ~ Check out Doctor Strange standing ready with a mandala of light in front of the Window of Worlds. Doctor Strange Movie Logo T-Shirt ~ Check out Doctor Strange movie logo atop a vibrant, orange mandala. 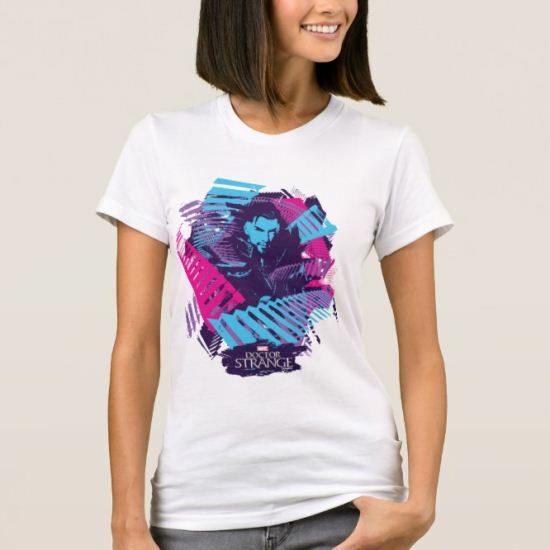 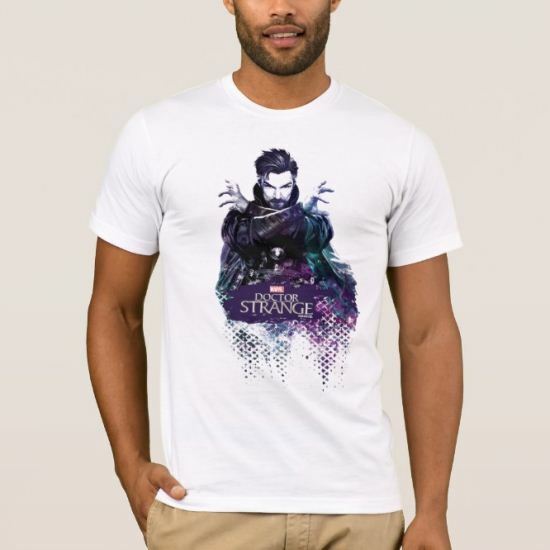 Doctor Strange Painted Stairs Silhouette Graphic T-Shirt ~ Check out this stylized graphic of Doctor Strange surrounded by pink, purple, and blue spiraling stairs. 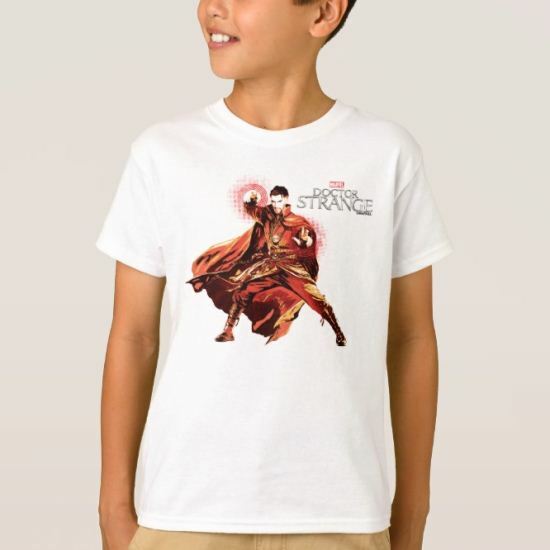 Doctor Strange Blocking With Mandala of Light T-Shirt ~ Check out Doctor Strange in a defensive stance, blocking with a magical mandala shield as his Cloak of Levitation billows around him. 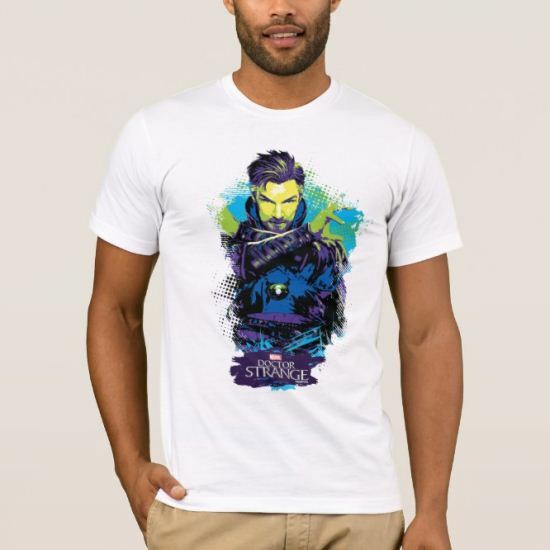 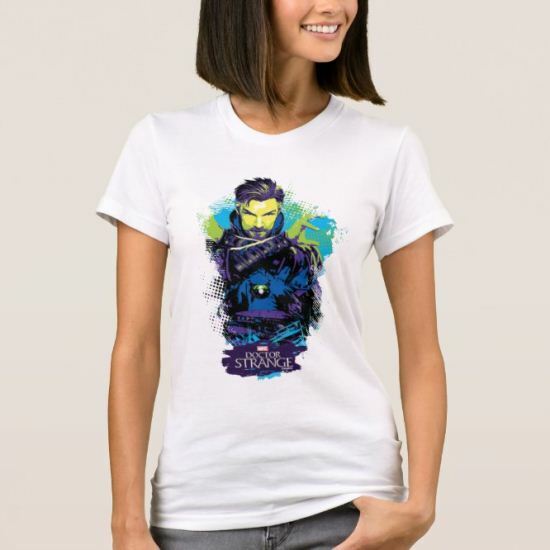 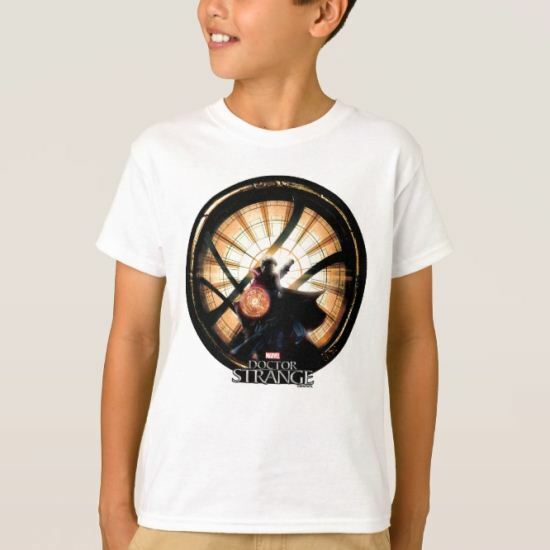 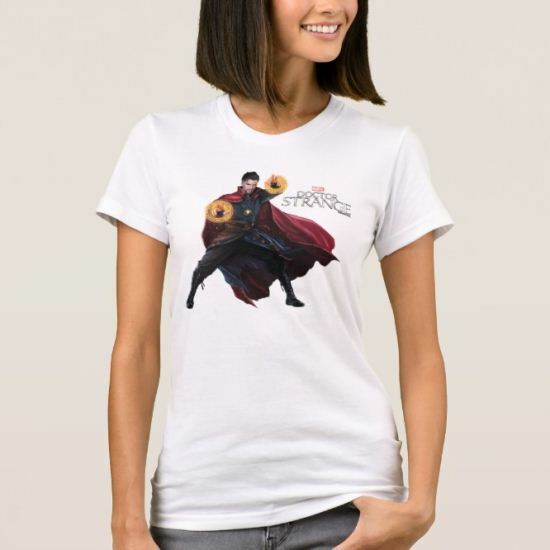 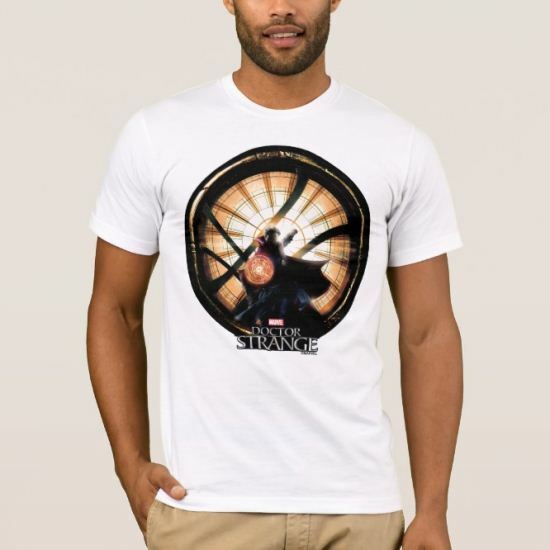 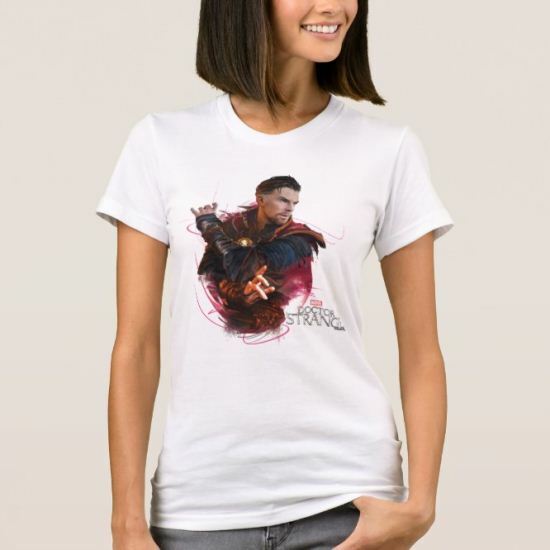 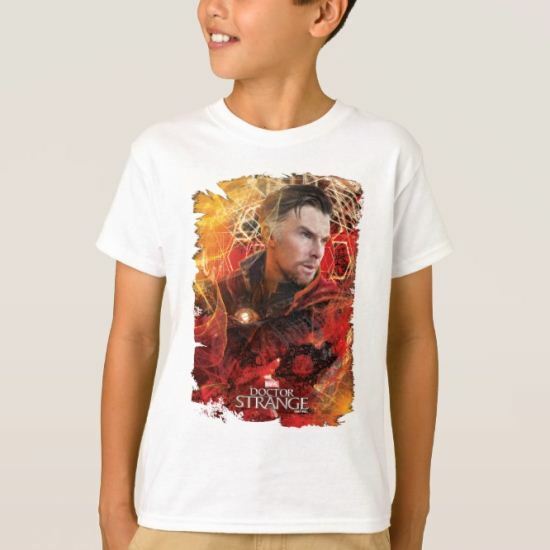 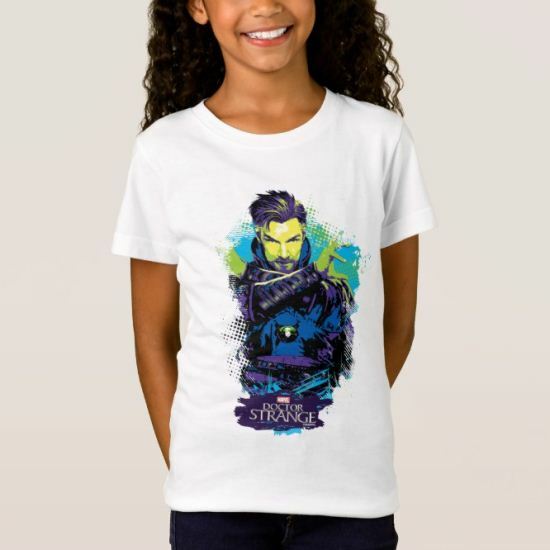 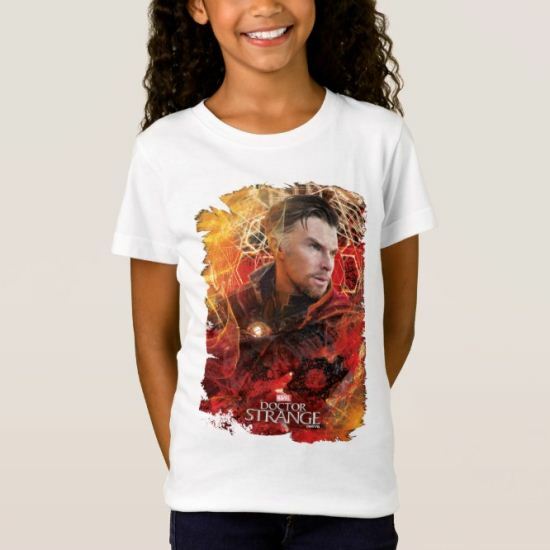 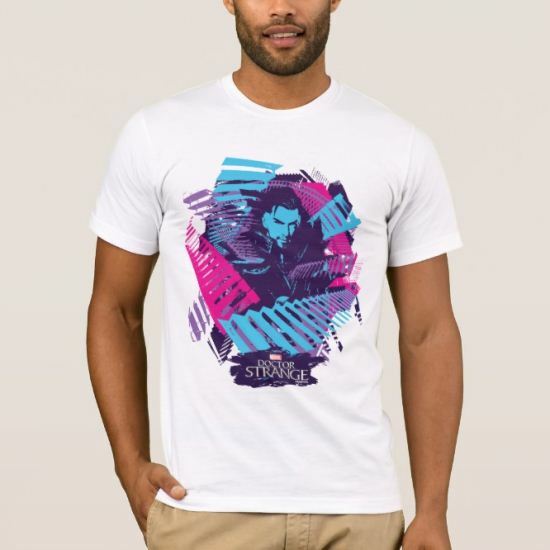 Doctor Strange Dark Watercolor Character Art T-Shirt ~ Check out this dark and grungy watercolor art of Doctor Strange holding his arms crossed in front. 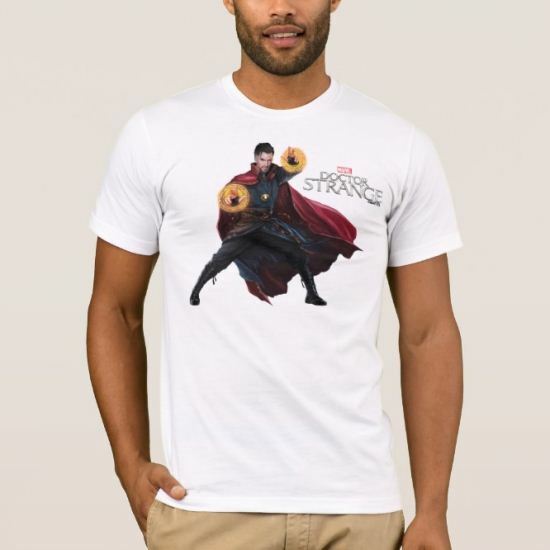 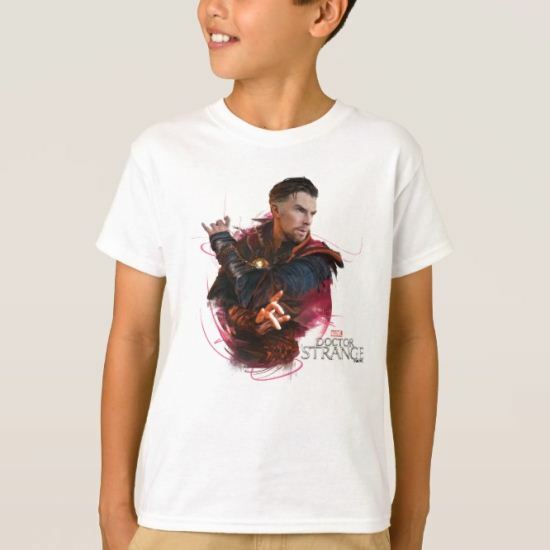 Doctor Strange Red Monochromatic Character Art T-Shirt ~ Check out this red monochromatic stylized art of Doctor Strange in a wide stance and wielding magic on each hand. 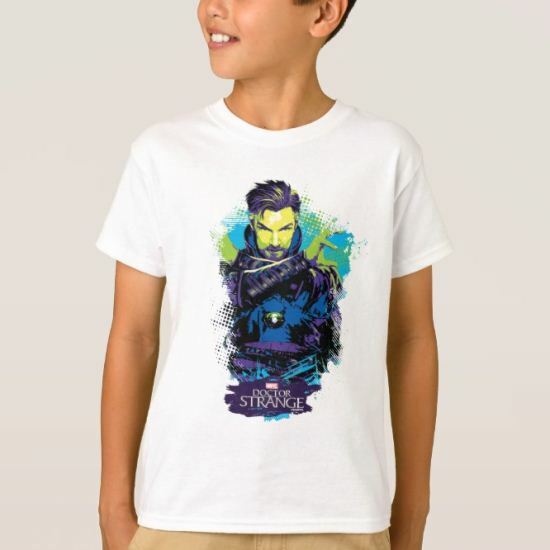 Doctor Strange Neon Paint Graphic T-Shirt ~ Check out this neon blue and green painted graphic of Doctor Strange with his arms crossed. 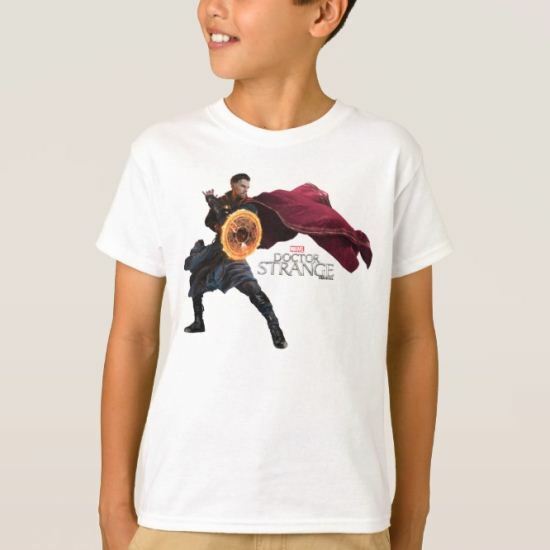 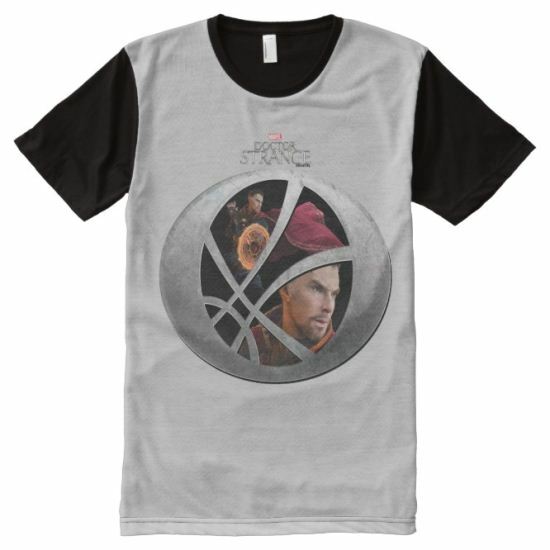 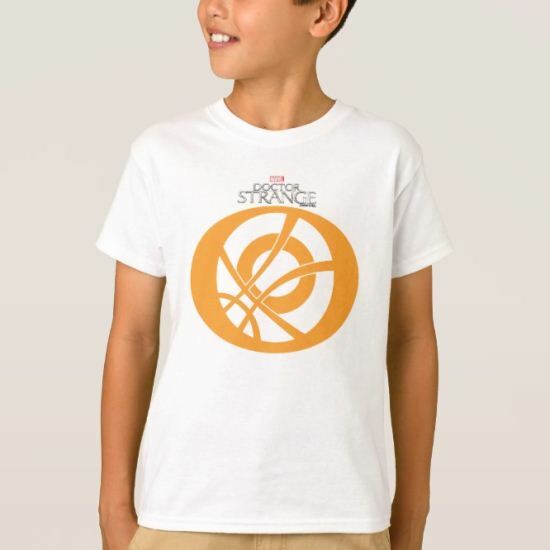 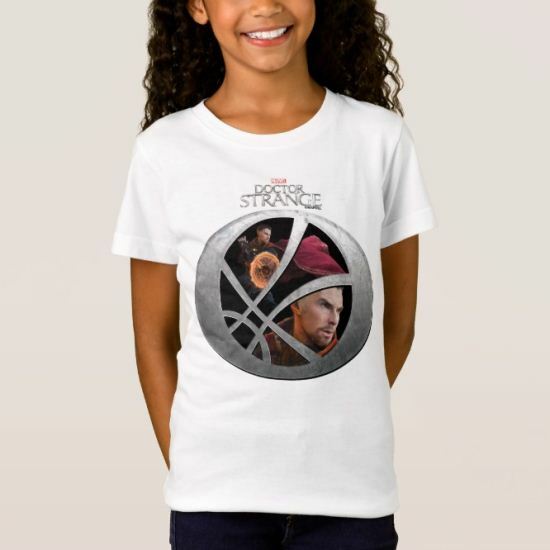 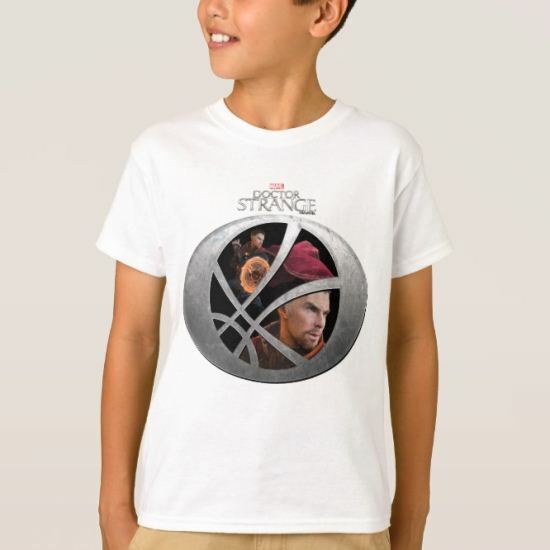 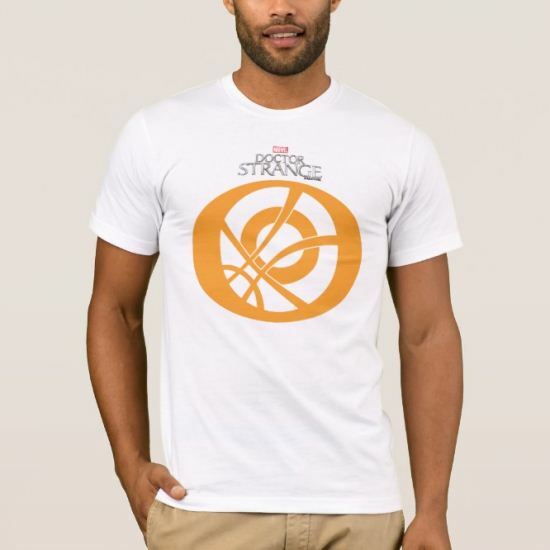 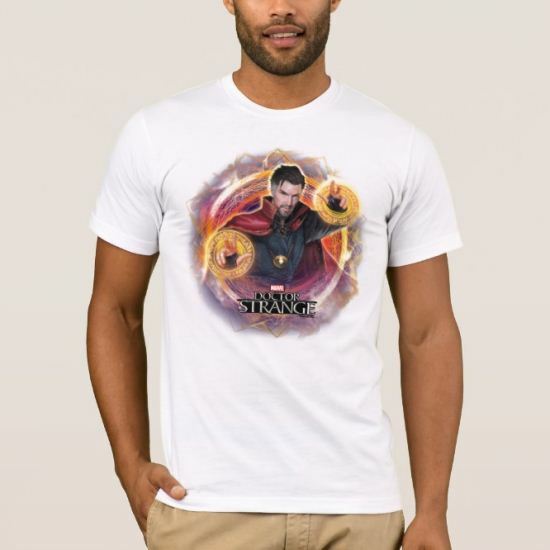 Doctor Strange Mystic Lines Character Bust T-Shirt ~ Check out Doctor Strange in this defensive stance, arms crossed, surrounded by magical swirls. Doctor Strange Wielding Mandalas of Light T-Shirt ~ Check out Doctor Strange as he wields a mandala of light in each hand, ready to fight. 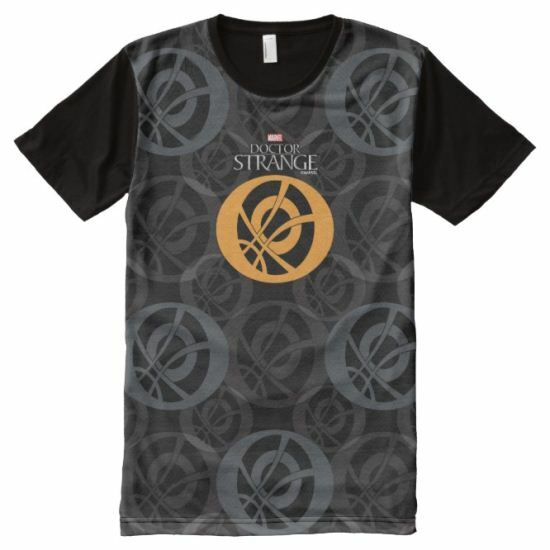 Doctor Strange Eye of Agamotto Pattern T-Shirt ~ Check out this icon and pattern of the Eye of Agamotto. 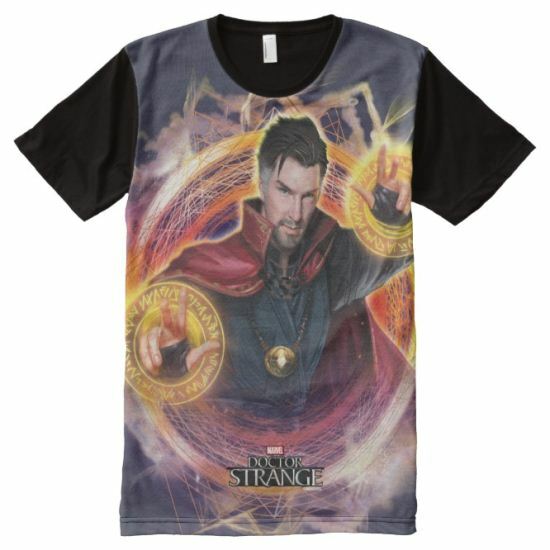 Doctor Strange Worn Mystical Graphic T-Shirt ~ Check out Doctor Strange surrounded by mystical symbols in this worn edged graphic. 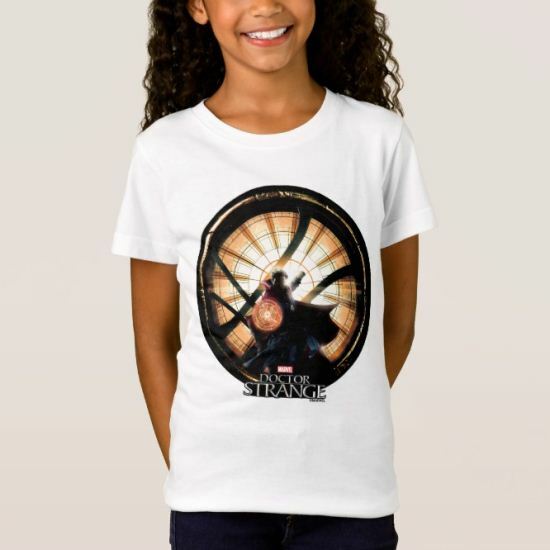 Doctor Strange Within Seal of Vishanti T-Shirt ~ Check out these character poses of Doctor Strange as seen through the Seal of Vishanti. 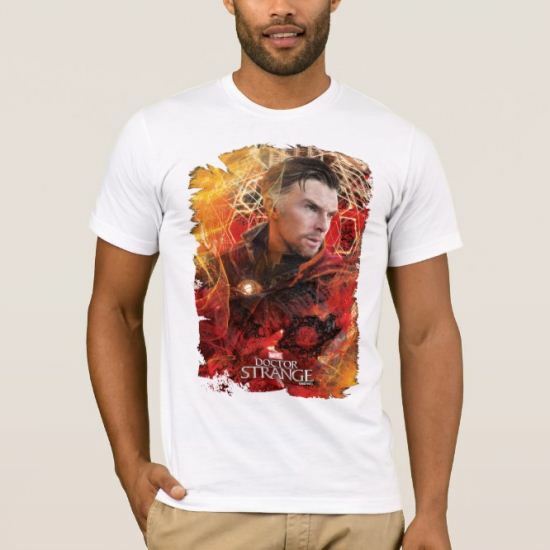 Doctor Strange Dark Watercolor Character Art All-Over Print Shirt	– Doctor Strange | Check out this dark and grungy watercolor art of Doctor Strange holding his arms crossed in front. 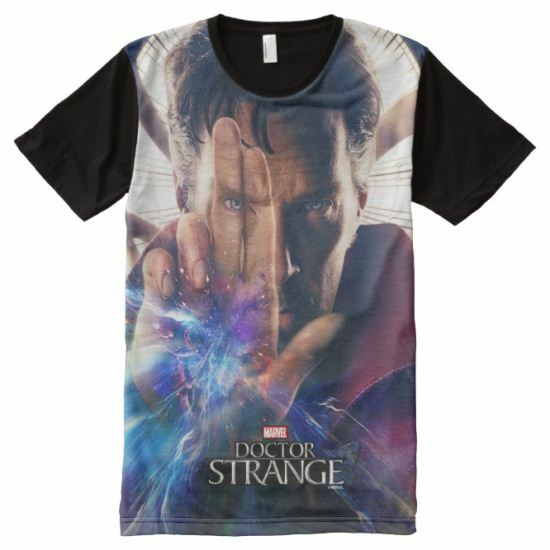 Doctor Strange Mandalas of Light Graphic All-Over Print Shirt	– Doctor Strange | Check out Doctor Strange within a mystic circle holding up mandala hand gestures. 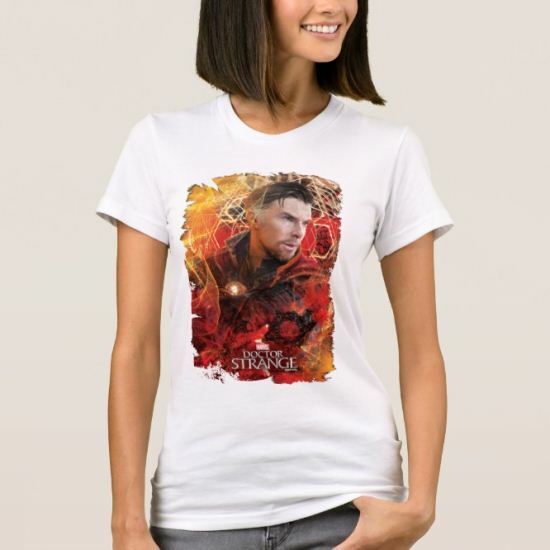 Doctor Strange Window of Worlds Graphic All-Over Print T-Shirt ~ Check out this graphic of the Window of Worlds silhouette created with a vibrant, red galaxy. 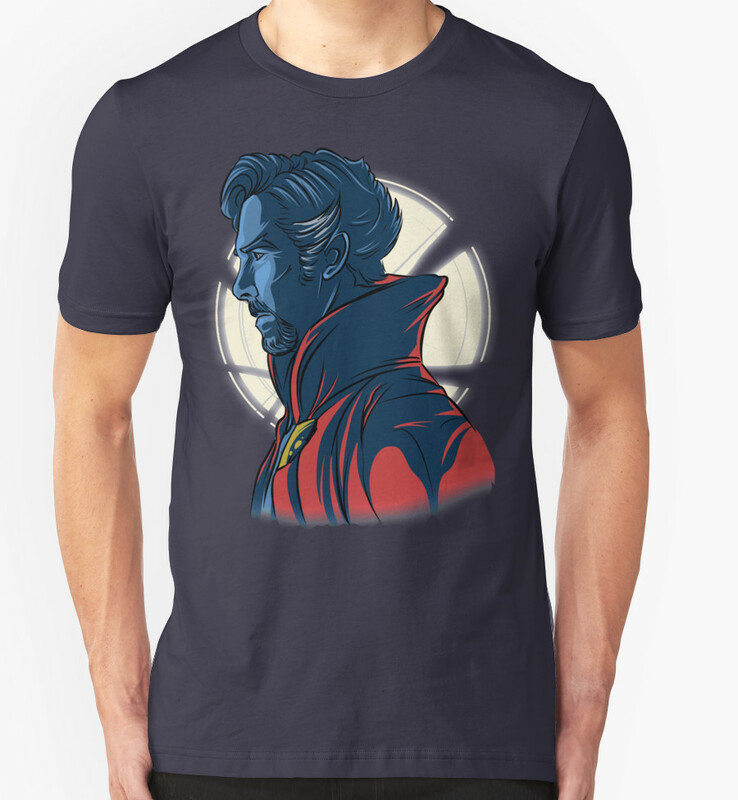 Doctor Strange In Front of Window of Worlds All-Over Print T-Shirt ~ Check out Doctor Strange standing ready with a mandala of light in front of the Window of Worlds. 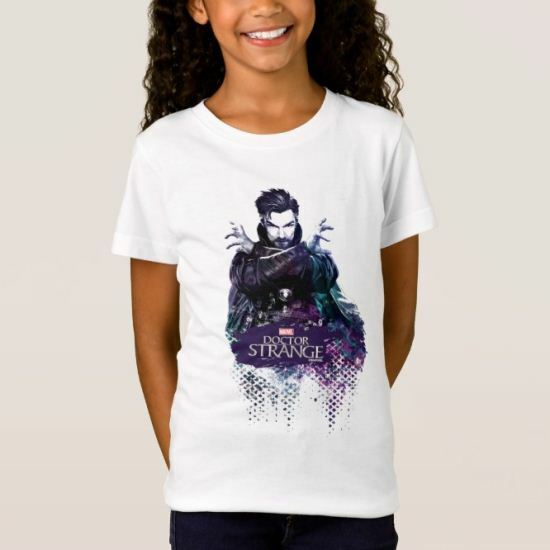 Doctor Strange Galaxy Character Silhouette T-Shirt ~ Check out this silhouette of Doctor Strange created with a vibrant, purple and pink galaxy. 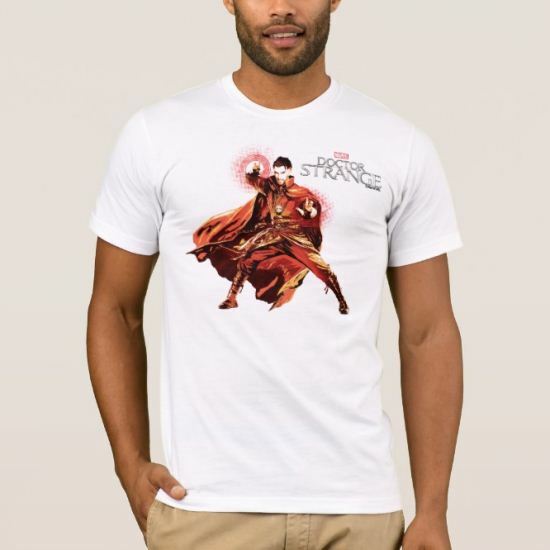 Doctor Strange Red Monochromatic Character Art All-Over Print Shirt	– Doctor Strange | Check out this red monochromatic stylized art of Doctor Strange in a wide stance and wielding magic on each hand. 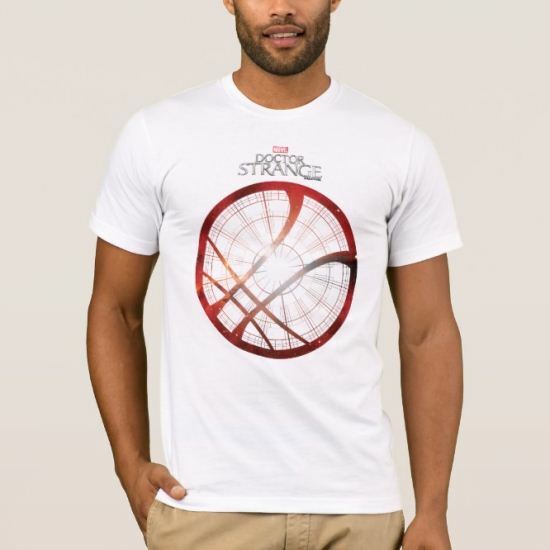 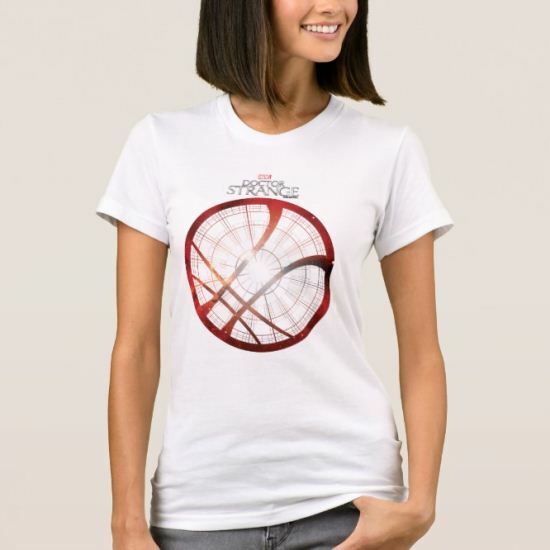 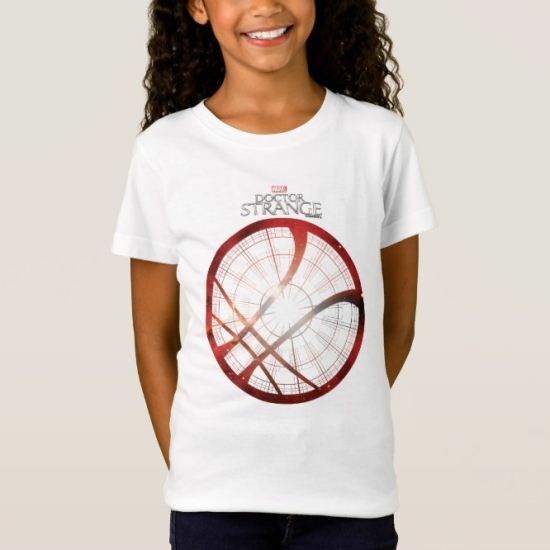 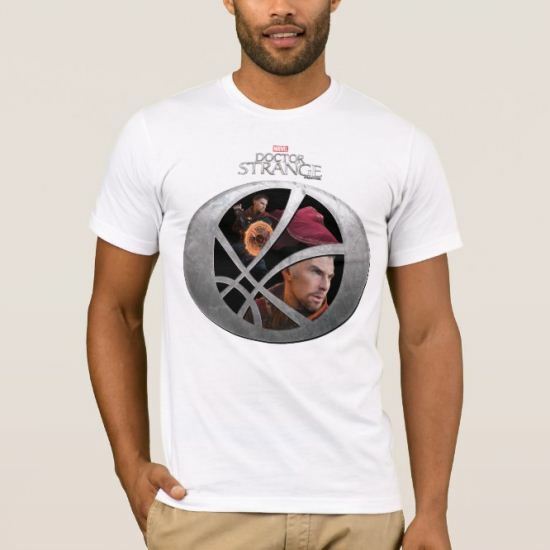 Doctor Strange Window of Worlds Graphic T-Shirt ~ Check out this graphic of the Window of Worlds silhouette created with a vibrant, red galaxy. 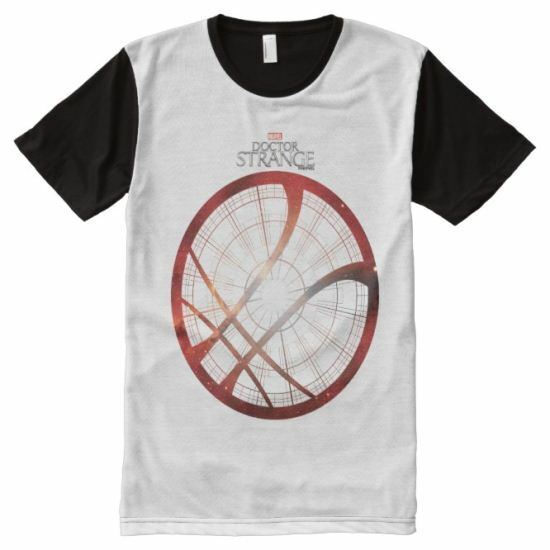 Doctor Strange Movie Logo All-Over Print T-Shirt ~ Check out Doctor Strange movie logo atop a vibrant, orange mandala. 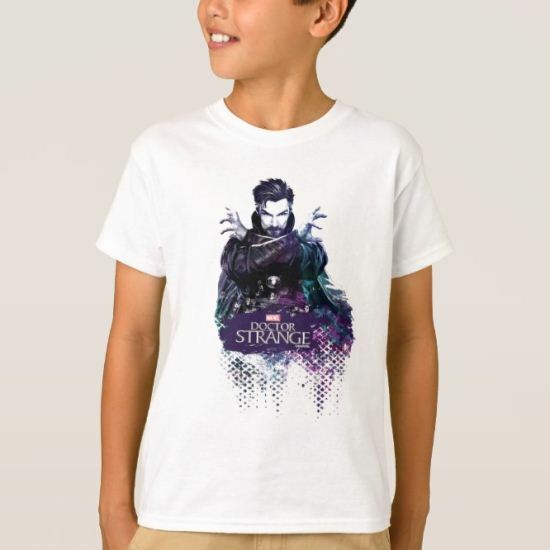 Kaecilius And Doctor Strange Watercolor Graphic All-Over Print Shirt	– Doctor Strange | Check out this vibrant watercolor art of Kaecilius standing back to back with Doctor Strange. 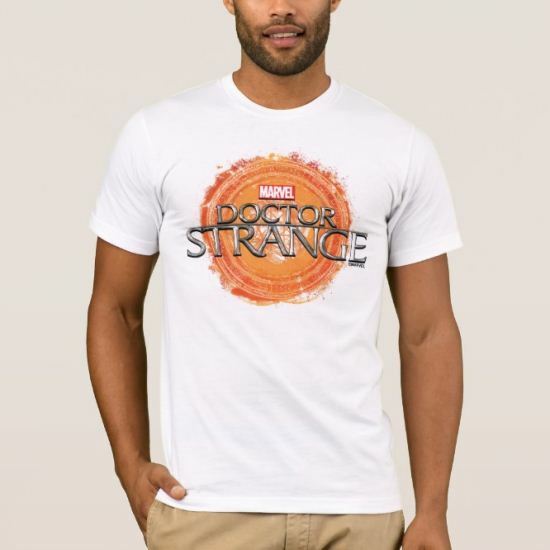 Doctor Strange Eye of Agamotto Pattern All-Over Print Shirt	– Doctor Strange | Check out this icon and pattern of the Eye of Agamotto. 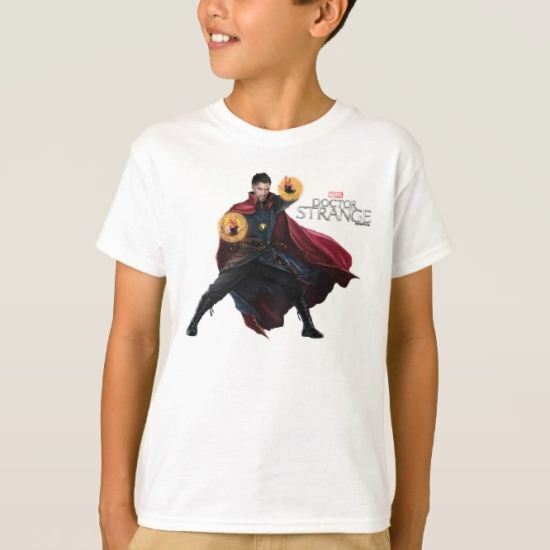 Doctor Strange Within Seal of Vishanti All-Over Print T-Shirt ~ Check out these character poses of Doctor Strange as seen through the Seal of Vishanti. 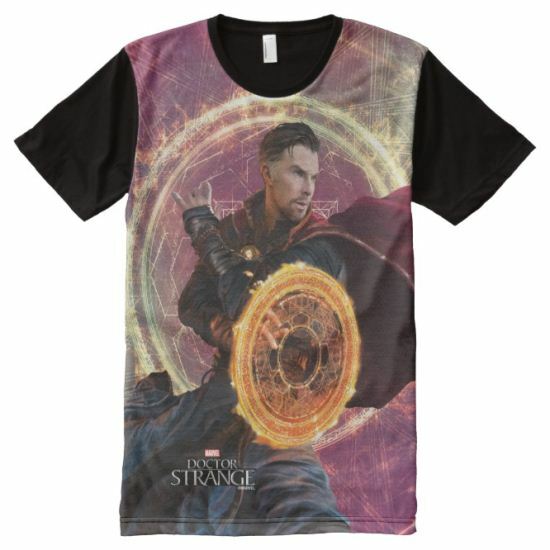 Doctor Strange Blocking With Mandala of Light All-Over Print T-Shirt ~ Check out Doctor Strange in a defensive stance, blocking with a magical mandala shield as his Cloak of Levitation billows around him. Doctor Strange Mandalas of Light Graphic T-Shirt ~ Check out Doctor Strange within a mystic circle holding up mandala hand gestures.